Finding the best AR500 steel targets for sale isn’t an easy task. There are so many different kinds available. 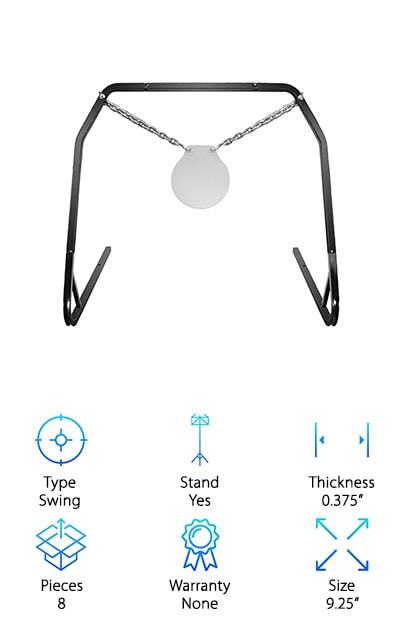 Swing or silhouette? Pop-up or static? Do you need IPSC steel targets or not? That’s why we put in the time to do our research. We looked at some of the best-selling items and most popular brands to put together these AR500 target reviews. Let’s take a look at some key features you should know before we get to our reviews. Type: We chose a few different types of targets. Most of them are swinging gong types but there are a few silhouettes, too. 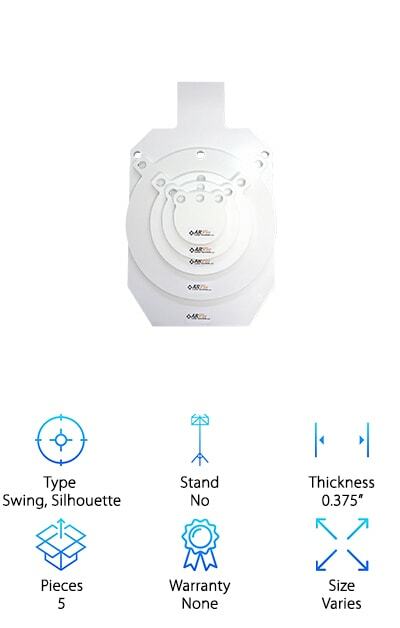 One even gives you the option between swing and silhouette. Plus, we found awesome jumping and pop-up targets. Stand: For some types of targets, a stand is required. Specifically, if you have a swing or silhouette target, you have to have some way to mount it. We did find a few that have a stand included. Thickness: Thickness will determine the caliber of the ammo and the power of the gun you can use with each of these targets. Make sure you’re not using something too powerful, it could really cause a lot of damage. Pieces: Most of these are singles targets. That said, we did find one really awesome set that we included that has 5 targets in it. Plus, the items that come with stands included often have more parts. Warranty: Warranties vary. Some of them we were just not able to find warranty information on. Keep in mind that for any target with a warranty, you have to follow the guidelines as to what and how far away to shoot. Size: Get the size that you need to work on your skills. Obviously, the larger the target, the easier it will be to hit. If you’re experienced, get something to challenge yourself! Amateur? Get a size you’ll learn from. Now that you know what to look for when shopping for AR500 steel targets, let’s move right into our reviews. Are you running short on time? We got you! Check out our top pick and budget pick first. They’re the first 2 items on our list and will give you some idea of what’s out there. Be sure to check out the other amazing products that round out our top ten, too! Okay, are you ready? Let’s get to it. Our top pick is from ShootingTargets7 and is one of the best ar550 steel targets around. First of all, they’re made in the USA right in Michigan. If you use them properly and take into account the caliber of your weapon and the distance to the target, your gong target will be covered by their lifetime guarantee. What makes them some of the best metal targets for sale? They’re cut from hardened steel that’s able to sustain a lot of shots without showing any damage. In fact, they’re often used in military and police training exercises. If used appropriately, any bullet that comes in contact with this AR500 steel target will disintegrate or bounce off upon impact. 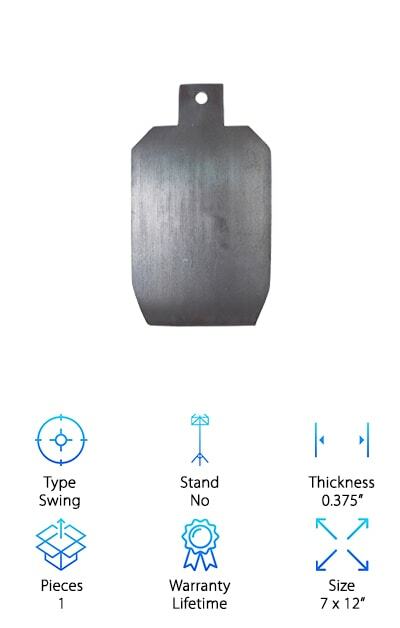 While this target is available in a range of thicknesses, the ½” in best if you’re looking for superior reactive steel targets. If you’re looking for a cheap AR500 steel target that won’t put you over budget, the Tactical Scorpion Gear Target Gong might be just what you’re looking for. 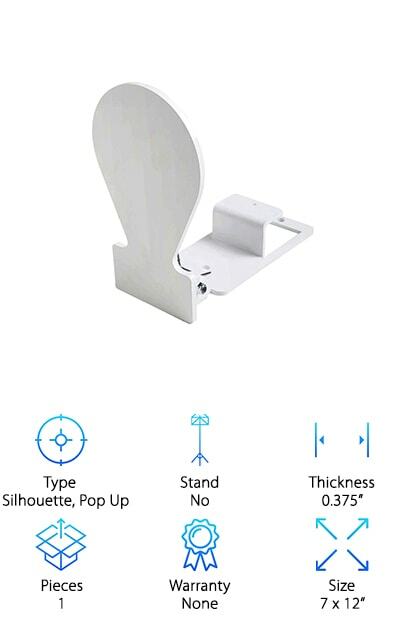 These cheap steel targets have 2 large mounting holes at the top that are solid and won’t break when you hang them from a stand. These targets are really good quality. They’re laser cut, which means their edges are clean and the steel kept its integrity through the process because it wasn’t overheated. Follow the specs about the weapon caliber and maintain the right distance when you’re shooting at these cheap AR500 steel targets. If you use these as they were meant to be used, they’re covered by a limited lifetime warranty. Stay 10 yards away with a handgun and at least 100 yards away with a rifle. KRATE makes some serious AR500 steel shooting targets. Get this: they’re created by a Marine Corps veteran and are designed for use by the military and law enforcement. The steel is cut with laser precision to maintain the strength of the steel. These long range targets some with a lifetime warranty because they put so much care into their work, they know these AR500 steel plate targets will last and last. You can use these targets with a range of pistols and rifles. They make a really satisfying “clank” noise when you hit them so you know right away if you made a successful shot. They also swing freely so you’ll have visual indicators, too. Make sure you keep the right distance - 10 yards for pistols and 100 yards for rifles - to protect both you and your target from any serious damage. This set of 5 AR500 reactive targets is a great choice if you want some different sizes to aim at. Each of the AR500 targets for sale included in this set is ? inch thick. They range in size and shape slightly. You get one 12 x 20 inch plate and 4 circles with diameters of 12, 8, 6, and 4 inches. One of the things we like a lot about this set of AR steel targets is that they’re all powder coated. When you use these targets, you’ll see that your shots will start to chip away at the powder. Another great thing about these is that you have some versatility in how you can hang them. Either use chains and a stand for gong targets or attach them to a mount if you’d rather have a silhouette. These are some of the best shooting targets we came across in all of our research. Why? They’re really unique and truly fun to shoot. These ar400 steel targets basically jump and move all around upon impact. What’s great about them is you never have to worry about repositioning them. The way they are designed, there’s always a target in the right spot for you to aim at. When your bullet makes contact with these a500 steel targets, they jump and move again. These also make portable shooting targets because they’re not mounted to anything. Plus, they’re small and lightweight so it’s really easy to pick them up and get on the go! These targets are a really fun way to practice. If you want reactive shooting targets, these are great. And here’s the kicker: they’re made of steel in the USA. 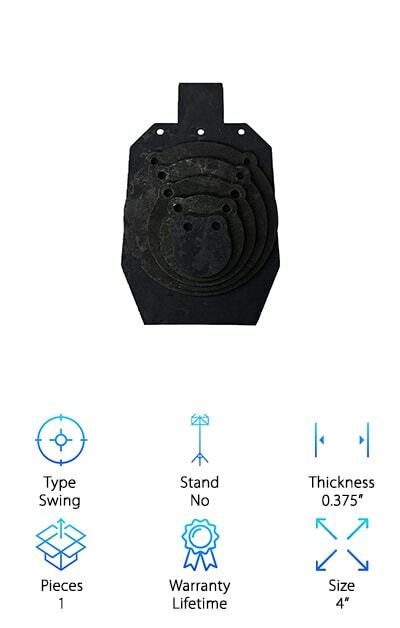 For steel plate targets that are reliable and come with everything you need to set them up, here are the metal shooting plates for you. Birchfield Casey makes a super sturdy target with this one. 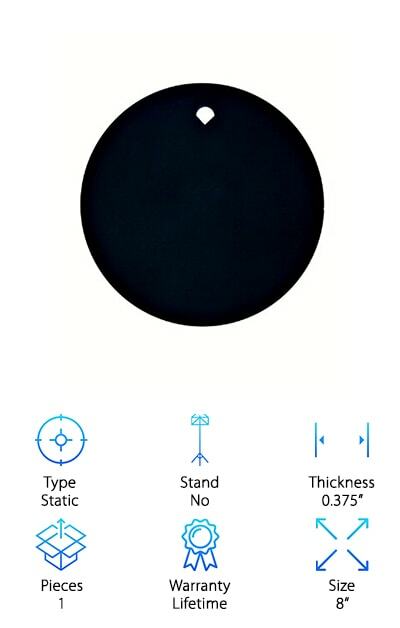 It’s made of ½” thick steel and the stand is really easy to set up. 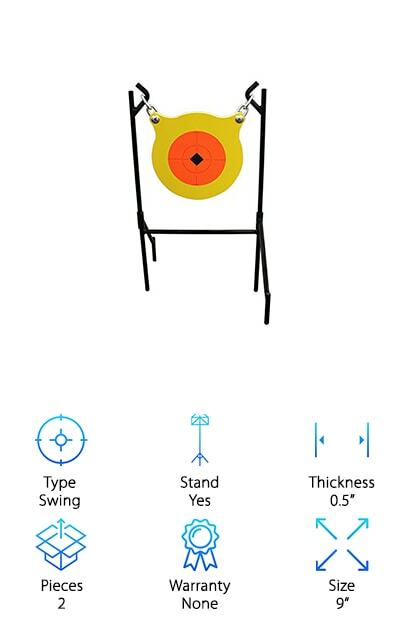 We think these are the best steel targets if you’re looking for a traditional target that’s portable. The stand is really easy to fold up and store when it’s no longer being used. At the same time, it’s also easy to throw it in the back of your truck and head out to set up your own firing range. As usual, make sure you’re using the right distance to shoot depending on your weapon. Too close, with too high a caliber and you can cause some damage. 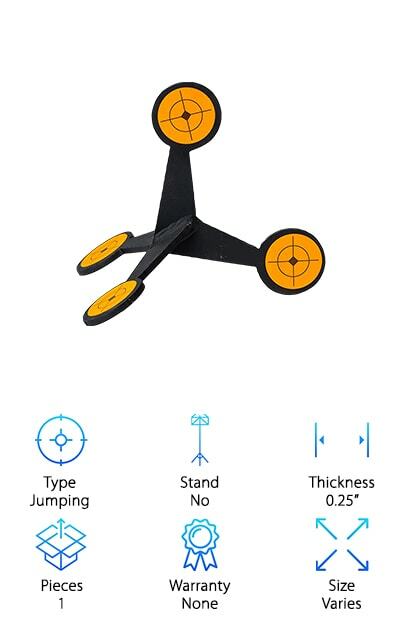 The steel targets from High Caliber are available in a range of sizes and as a gong or silhouette. Regardless of what size and shape you get, though, they’re all really well made. High Caliber is a small business located in the Midwest. They use a plasma table to cut the hard steel to shape the targets. This has an effect similar to laser cutting: less of the steel is exposed to high heat so the target ends up being stronger. While the targets are painted flat black, you can even request other colors like white, orange, and red! Why does that matter? Because you might be able to see a red or white target better than you can see a black one so you’ll have more accurate aim! These targets all come ready to hang with ?” holes. We love when we see steel targets for sale that have everything you need to start using them right out of the box. That’s why these Caldwell AR500 shooting targets stood out. First of all, it comes with the frame. The frame is made of steel tubing and, get this, it just snaps together. No tools needed to put it up or take it down! In fact, we think these metal shooting targets are a great choice if you’re looking for something portable. The reactive targets in these sets are made of really hard steel that will last a long time. They can definitely take the wear and tear of being frequently transported from place to place. And, man, they can take a bullet! They’re made to withstand serious impact without losing their integrity. These are cool AR500 silhouette targets that have a little extra something. See, this AR500 steel silhouette target from RMP is actually spring loaded. Once you hit these tactical targets, they pop right back up, ready for another shot. These are ideal for various pistols and rifles and, as always, you have to make sure you’re standing at the proper distance when shooting in order to keep the steel intact. 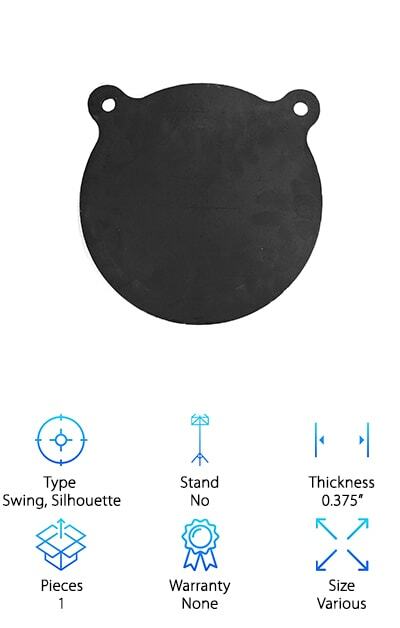 The manufacturer of these steel silhouette targets for sale recommends a distance of at least 100 yards when shooting with rifles. There are a lot of ways to use this pop-up target. Mount it to a tabletop, stake it to the ground. You could even put it on the top of a 4x4 post. Whatever you choose, you’ll see these are great steel challenge targets. 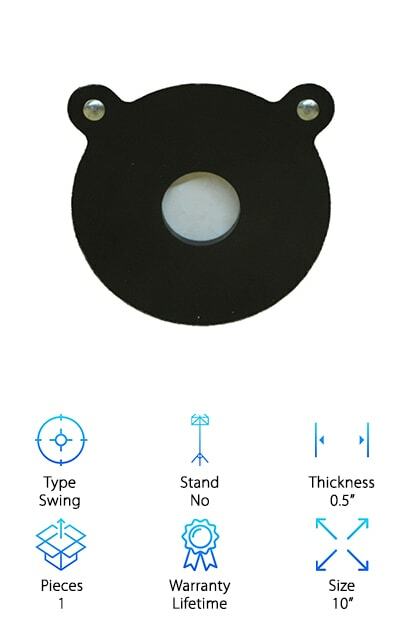 If you’re realized while looking for AR500 steel targets for sale that you want a static target, look no further. These steel shooting plates from Xsteel are just what you need! It’s cut from ?” steel and ready to use with a variety of pistol calibers and rifles. These targets are laser cut, which actually makes a big difference. Laser cutting exposes the steel to less heat. Heat weakens steel so the less heat exposure, the better. These targets come unpainted so you can choose to paint them a color that works for you! Another thing we think you’ll really like about this target is the sound. It will let you know clearly and immediately that you’ve hit your mark. If you’re unhappy with this target, no need to worry. It comes with a money back guarantee.